WASHINGTON, DC, October 3, 2013 (ENS) – Due to the shutdown of the U.S. federal government caused by the lapse in appropriations as of October 1, the National Park Service has closed all 401 national parks and suspended operation of dozens of community assistance programs. All park grounds, visitor centers, hotels, campgrounds, and park roads, except for thruways, are closed. Thousands of interpretive and educational programs are canceled and permits issued for special events on park grounds nationwide are rescinded. Park visitors in all overnight campgrounds and lodges have been given until no later than 6:00 pm Eastern Daylight Time today to make other arrangements and leave the parks. 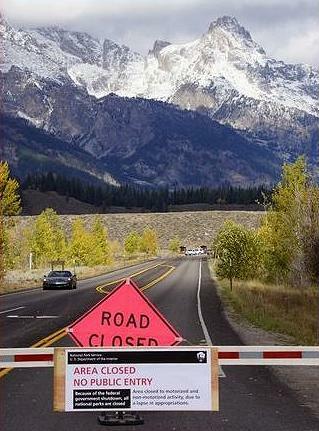 All national parks will remain closed until the government reopens. U.S. Customs and Border Patrol Port of Entry Operations, CBP Cargo Security and Revenue Collections, and Border Security programs, including Border Patrol and CBP Air and Marine Operations, will remain operational under the shutdown because they have been deemed law enforcement necessary for the safety of life and protection of property. Still, travellers to the United States are being affected and tourism is one of the hardest-hit industries. 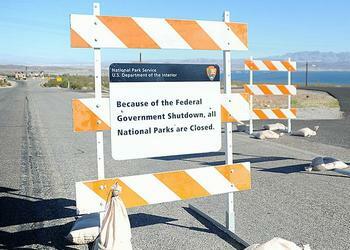 Border wait times may increase, and all national parks, museums and monuments are now closed. An October shutdown is costing the National Park Service an estimated $450,000 per day in lost revenue from fees collected at entry stations and fees paid for in-park activities such as cave tours, boat rides and camping. The National Park System hosts more than 715,000 people per day in October. Those visitors spend about $76 million per day in communities near national parks. Because of the shutdown, 15,000 people a day planning to visit the Statue of Liberty have had their reservations cancelled. All mule trips in Grand Canyon National Park, an iconic tradition dating back more than 125 years, will be cancelled. More than 7,500 people a day coming to enjoy Old Faithful and the other splendors of Yellowstone National Park will be turned away. The shutdown will affect more than 20,000 National Park Service employees, who are furloughed until an appropriation is passed. Some 3,000 employees continue to work, providing essential services, including security, emergency services and firefighting. Additionally, approximately 25,000 concession employees are employed in national parks during the summer and about half of them are still on the job in early October. Because it will not be maintained, the National Park Service website will be down for the duration of the shutdown, closing off access to 750,000 web pages about national parks and programs. NPS.gov is used extensively for educational purposes and travel planning by 91 million unique visitors every year. The Coalition of National Park Service Retirees is criticizing Congress for its partisan politics resulting in the government shutdown, jeopardizing the livelihood of nearly one million public servants, including thousands of National Park Service employees. Many other federal government agencies are affected. Of the 549 federal employees of the Bureau of Ocean Energy Management, only 73 are on the job. The BOEM conducts offshore leasing, resource and economic evaluation, review and administration of oil and gas exploration and development plans, renewable energy development, National Environmental Policy Act analysis, and environmental studies. The Department of the Interior’s Bureau of Land Management is responsible for 13 percent of the United States land mass and more than 40 percent of all federally-managed lands. Due to the shutdown, essentially all BLM activities are halted with the exception of law enforcement and emergency response functions. This agency is keeping 300 law enforcement employees on the job, plus 170 others to respond to emergencies involving safety of human life and protection of property across the states. The Environmental Protection Agency has furloughed nine out of every 10 employees, leaving Americans with hardly anyone to monitor pollution. “The government shutdown we now face means no cops on the beat against toxic pollution. It means that we’ll have to dress like oil executives if we want to visit our national parks and monuments. It means hundreds of thousands of Americans are at home instead of at work. And it means House Republicans who couldn’t achieve their reckless agenda through elections or legislation are willing to sacrifice the health of our families and our communities to simply score political points.